Another wall features some spectacular self portraits from a variety of art movements. It also has digital screens that display self portraits made right there at the museum. The portrait station consists of a mirror to reflect the painters face right next to a touch screen display with a digital paint program. 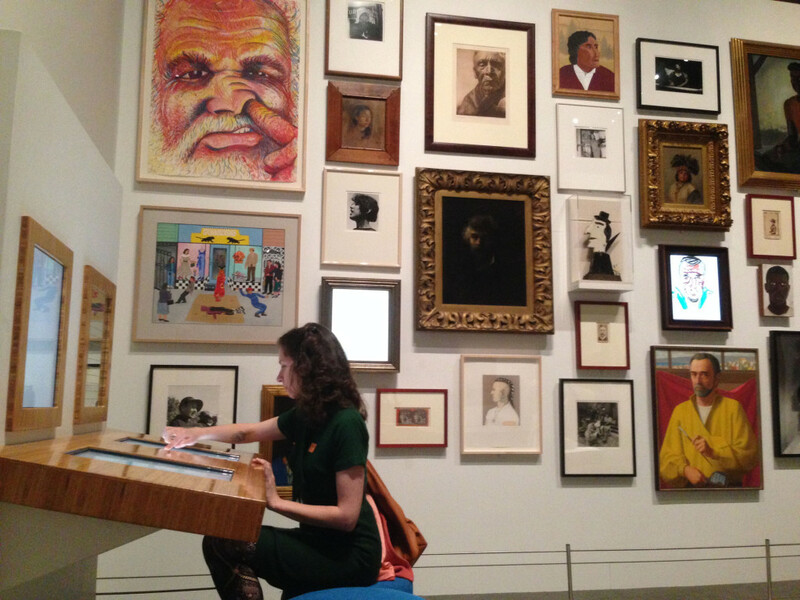 Anyone can sit down and in just a few minutes, they can create their own portrait that is then displayed right there in a real-live art museum, right next to other real live arts. Awesome. So why is some art is a museum? Sometimes art is displayed because it is aesthetically pleasing, often the result of long-practiced tangible skills. Other times art is in the museum because it is provocative or challenging in culturally sensitive way. Museum Art can ask philosophical questions, or call attention so societal tensions. Often, art is both aesthetically pleasing and provocative. The thing about art is that the message, the provocation, can be buried in the medium, and in order to understand the metaphor, the viewer must have an adequate literacy of the medium. For example, to understand Andy Warhol, you sort of have to know that the process he used for creating his art. Silk screening is the same technical processes used by massive commercial companies to label consumer goods. Through the process of silk-screening his art, Warhol was able to put Madonna and Campbell’s soup and other consumer goods on the same pedestal in the museum. The other thing that the Oakland Museum portrait station does is pull back the curtain on the artistic process. With some Art, we may wonder how it ever ended up in a museum, but with other works of art we can’t help but marvel at the impossible beauty or abstract realism that was achieved by the artist. Its not all skill and magic though, artists use a variety of tools to help create the spectacle. This exhibit reveals one of those tools that is often used in painting: the grid. The mirror next to the digital painting screen, the one that reflects the artists face when they sit down, that mirror has a grid on it. With a grid, pretty much anyone can look at an image divided into squares and accurately copy what exists. Through the use of grid technology it is possible for even an amateur artist to achieve a proportionately accurate representation of reality. Once this tool is applied, the process isn’t much different from a coloring book, complete with the option of coloring inside the lines. People often marvel at Reniassance artist’s ability to depict reality. But they didn’t do it all on their own, they used technology. In this podcast, the folks at Radiolab are saying that humans can use tools to realize that they are capable of doing novel things. MIDI (early electronic music technology) allowed humans to realize a completely new style of music. Once we see it done, we have a new-found literacy to create music in this style without the original tool. Also mentioned in the podcast: Jet skis that pull surfers out past waves so large they were once thought impossible to ride. Then surfers found out that they could get out there with a jet ski, and once people saw it done, they decided that they could swim out and catch the big one without the technological prosthetic. Monkey see monkey do. We’re really good at copying actions of others. It also seems that humans are capable of emulating the actions of tools and frameworks. I can’t help but wonder what other tools exist in the world that will allow everyone to create a deeper understanding art and the technical processes that allow Artists to create museum-quality work. I dream of a world where everyone intentionally creates art as a form of participation in the global discussion about what it means to be human.